Marcell Missura is a postdoc researcher and teaching assistant at the Humanoid Robots Lab of the University of Bonn in Germany. He obtained his PhD from the University of Bonn in computer science in 2016 for his work on bipedal walking with push recovery capabilities. Marcell has earned six world champion titles and three times the Louis Vuitton Best Humanoid Award in the international RoboCup competitions. His research topics include motion planning in dynamic environments and robust bipedal walking for humanoid robots. Marcell Missura, and Maren Bennewitz. Proceedings of the IEEE/RSJ International Conference on Robotics and Automation (ICRA), 2019. Marcell Missura, Daniel D. Lee, and Maren Bennewitz. Proceedings of the IEEE/RSJ International Conference on Intelligent Robots and Systems (IROS), 2018. Peter Regier, Marcell Missura, and Maren Bennewitz. Proceedings of the European Conference on Mobile Robots (ECMR), 2017. M. Missura, D. Lee, O. von Stryk, and M. Bennewitz. Proceedings of the IEEE/RSJ International Conference on Intelligent Robots and Systems (IROS), 2017. Dissertation, Mathematisch-Naturwissenschaftliche Fakultät, Universität Bonn, 2016. Proceedings of IEEE/RSJ International Conference on Intelligent Robots and Systems (IROS), Hamburg, Germany, September 2015. German Journal on Artificial Intelligence (KI), 2015. Proceedings of 14th IEEE-RAS International Conference on Humanoid Robots (Humanoids), Madrid, Spain, November 2014. RoboCup 2013: Robot World Cup XVII, Lecture Notes in Computer Science 8371, pp. 56-67, Springer, to appear 2014. Proceedings of 13th IEEE-RAS International Conference on Humanoid Robots (Humanoids), Atlanta, GA, October 2013. A ROS-Based Software Framework for the NimbRo-OP Humanoid Open Platform. Proceedings of 8th Workshop on Humanoid Soccer Robots, IEEE-RAS International Conference on Humanoid Robots (Humanoids), Atlanta, October 2013. Self-stable Omnidirectional Walking with Compliant Joints. Proceedings of 17th RoboCup International Symposium, Eindhoven, Netherlands, June 2013. 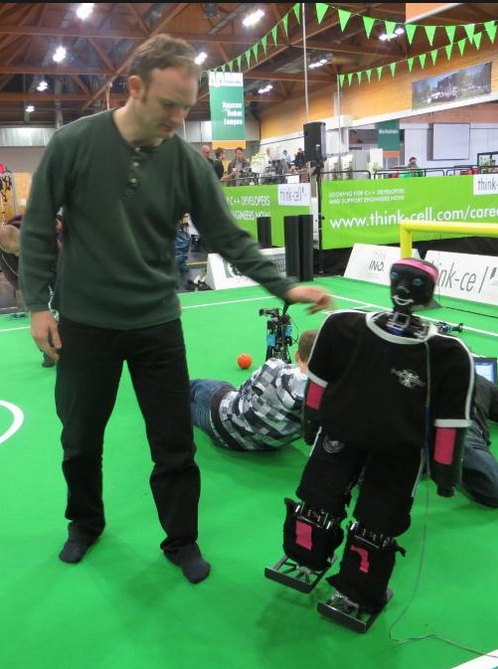 RoboCup 2012, Robot Soccer World Cup XVI, LNCS 7500, pp. 89-93, Springer, 2013. Proceedings of 7th Workshop on Humanoid Soccer Robots, IEEE-RAS International Conference on Humanoid Robots, Osaka, November 2012. In: RoboCup 2011: Robot Soccer World Cup XV, LNCS 7416, pp. 37-50, Springer, 2012. In: RoboCup 2012: Robot Soccer World Cup XVI, LNCS 7500, pp. 1-12, Springer, 2013. Proceedings of 11th IEEE-RAS International Conference on Humanoid Robots (Humanoids), Bled, Slovenia, October 2011. Proceedings of the 15th RoboCup International Symposium, Istanbul, July 2011. 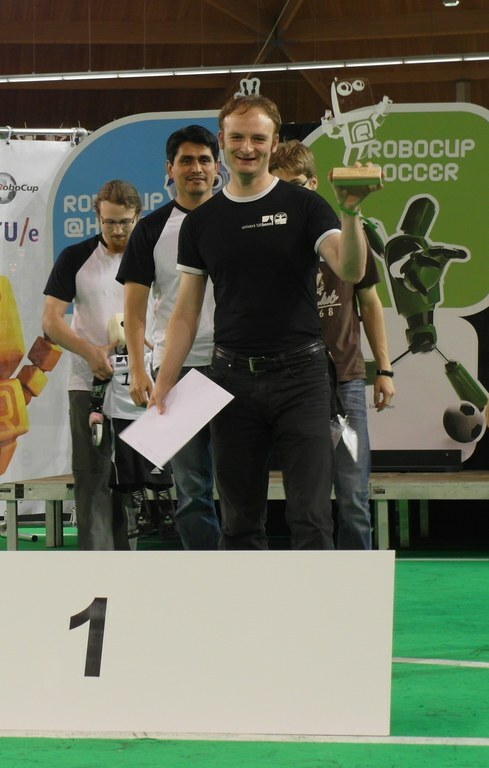 In: RoboCup 2011: Robot Soccer World Cup XV, LNCS 7416, pp. 198-209, Springer, 2012. Proceedings of the IEEE International Conference on Robotics and Automation (ICRA), Shanghai, China, May 2011. Proceedings of 14th International RoboCup Symposium, Singapore, June 2010.